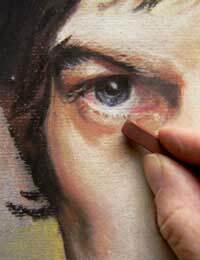 Portraiture is a genre of drawing and painting that arose principally out of the vanity of the higher classes. Having a portrait painted was a sign that someone had wealth, power and (depending on the outcome) taste. When the Church had supreme dominance over the affairs of both Kings, the nobility and peasants, the depiction in painting of anyone other than Jesus, Mary, Joseph, the Apostles and other Biblical characters was frowned upon. The only portraits of living people were generally those of the clergy and of the very rich, who would often be portrayed as favourably pious, in order to gain favour with the clergy and therefore with 'God'. As the authority of the Church was challenged portraiture opened up and portrayed a greater range of people, such as the nobility and very wealthy business persons, who would often demonstrate their wealth by acting as patrons to artists. Rembrandt and Velazquez are two examples of 17th Century painters who exemplified the trend towards a depiction of a wider group of people, echoing an enlightened political approach that was sweeping Europe and aimed towards gaining greater freedoms for all people. Velazquez (1599-1660) was a courtly painter, and as such was often party to the whims of King Phillip of Spain, who would have him painting pictures of himself, his son and his wife dressed to the nines and posing as only monarchs should/could. Despite these restrictions, Velazquez had a knack for conveying the life of lowlier persons and at times would paint, for example, the court dwarf. The court dwarf was kept in the court to demonstrate to the Royal family their own supremacy: Whereas the Royal family had been 'chosen by God' to rule and were 'perfect' the dwarf was a sign of imperfection. Given this role one might feel that the dwarf had a rather miserable life. Velazquez, as an enlightened painter no doubt saw the unfairness in this situation, and his portraits of the dwarf deftly convey a caring and sympathetic nature on Velazquez' part. Rembrandt (1606-1669), not tied to a court, was paid by wealthy Dutch people to have their portraits depicted, yet also found time to paint local peasants: This was an act conducted out of humility and a desire to document the plight of the poor and the humanity that existed even in the most deprived of areas. Such a move inspired later artists such as Van Gogh, who painted the town folk in Arles, the town he finally died in. These days it is common to have portraits painted of people in all walks of life and painters such as Frank Auerbach and Lucien Freud paint people from all walks of life, although the need for money always dictates that a certain amount of pictures will always be painted for wealthier patrons. The need to practice as well as the difficulty in always having a sitter to hand, coupled with the clichéd vanity of the artist means that the self portrait has always been an artists favourite. The self-portrait is often a testing ground for new ideas, resulting in some often remarkable paintings. The self-portraits of Rembrandt, Velazquez, Cézanne and Van Gogh are among the best paintings in existence across any genre. One thing that stands out in the self-portrait is the artist's ability to get beneath the surface of the paintings subject (in this case the artist themselves). Often you will be able to discern an emotion in the expression of the portrait's subject. This really is the aim of all portraiture, and is where drawing and painting sometimes has the edge on photography as with drawing and painting the emotion of the artist and sitter can be conveyed through the application of charcoal, pencil, paint, etc. It is the employment of mark-making and brush strokes that we really look toward when trying to understand a portrait. The intense shirt and hard lines on Van Gogh's self-portraits, for example, ( see, 'Self Portrait with Felt Hat', 1887-1888) signal the artist's intense emotional anguish. For an indication of this, look at any collection of portraits in a gallery local to you, and begin to develop your own language of mark-making: Intense short strokes evoke anger; softer flowing strokes evoke calmness, and so on.